Your Source For Ski Resort Deals. 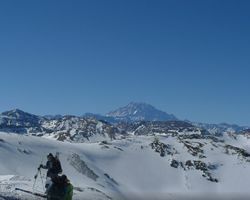 Ski vacation packages to Chile. Take advantage of our deals, discounts, the best planning advice, or create your own ski / snowboard package. Ski Arpa is a unique backcountry snow cat operation located in the remote Valle el Arpa in the Chilean Andes. While there are no lodging accommodations at the Ski Cat operation, we offer lodging packages in the nearby towns of Los Andes and San Felipe. Skiers and Riders can choose from single day cat skiing to multi day packages with lodging, transportation and meals. Also available are trip extensions to thermal hot springs and/or wineries in the Aconcagua Valley and day trips to the Portillo ski resort. Not only will you spend your days carving turns in deep powder, but also you’ll immerse yourself in Chilean culture, experiencing regional cuisine and characteristic Chilean hospitality. Ski Arpa multi day packages include lodging options with several preferred partners, offering accommodations to suit your individual needs and budget. A place unlike any other in the world, Valle el Arpa is sweet music to the skier's soul. Unparalleled snow conditions and views of Mt. Aconcagua make for an unforgettable adventure. In an anything-but-typical day, you’ll ski over 13,000 vertical feet of some of the best untracked powder in the world. Intermediate or advanced level of skiing experience required. Ski Arpa is the only full cat-skiing operation in all of South America. Full day cat trips start at $350.00 per person per day and 2 night/2 day ski packages start at $1,385.00 per person based on double occupancy. Call Toll-Free, 888-754-2167, to talk to a South America Ski & Snowboard Vacation Specialist today! Termas de Chillan, which means the “Spas of Chillán”, soars 1,650 meters above sea level on the slopes of the Chillán Volcano amidst the invigorating mountain air. With its location of about 82 kilometers from the flurry of the Chilean city of Chillán and almost 500 kilometers away from Santiago, Chile’s capital and largest city, Termas de Chillán was originally famous for its hot springs. Now, it is also the abode of a modern Ski Center and 3 hotels – one of which is the 5-star Gran Hotel that features a casino and a thermal spa. The Termas de Chillán Ski Center is marked by 28 trails served by 11 lifts, and has a total of 35 kilometer runs over 10,000 hectares of mountain terrain. 30 percent of this 10,000-hectare terrain is ideal for beginners while the remaining 40 and 30 percents are for medium level and expert skiers correspondingly. The Ski Center is also known to have South America’s longest ski run, the Las Tres Marias or The Three Marias, going on for a seemingly endless 13 kilometers. Aside from the spa, the Gran Hotel is also known to house the first mountain casino in Chile, restaurants, a bar, a convention center, three swimming pools, a souvenir shop, and other amenities you will be requiring during your vacation. Create custom Termas de Chillan ski vacations online, 24/7, using our interactive website. Simply choose your start and end dates, # of adults and children and click Create A Quote in the Trip Quote box above! Bundle and Save! Our ski vacation packages to Termas de Chillan, CL with exclusive discounts are backed by the best service in the industry. View our wide selection of lodging options, trail maps & webcams, snow reports, ski school information, dining, activities & shopping, and maps! Termas de Chillan Ski Resort Packages & Deals - Save up to 50% Need Help? Call Toll-Free, 877-4-SKI-EAST, to talk to a Ski & Snowboard Vacation Specialist today! The Valle Nevado Resort is a small self contained village located approximately 45 miles (2 hour drive) from the Santiago Airport high above the city of Santiago, Chile. 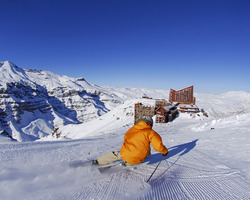 Valle Nevado offers access to the largest skiable domain in South America with nearly 7,000 acres. With such a vast amount of terrain the resort caters to all levels of skiers and snowboarders. Skiers and Riders can choose accommodations ranging from the budget friendly Hotel Tres Puntas, the family friendly Puerta del Sol or the 4* Hotel Valle Nevado as well as condominiums and apartments. All accommodations are located slope side or a short walk to the lifts and all hotel facilities and restaurants are located within walking distance of each other. All Valle Nevado Packages include accommodations, 2 meals daily, unlimited sking/riding during your stay, use of all facilities and all lodging tax. Information about 2013 season: Value season is the period from August 30 - September 27. During the value season period bookings do not have a minimum of nights required, except for the week of August 31 - September 7 that bookings must be 7 nights from Friday to Friday. Regular season is the period from June 28 to July 4 and from July 26 to August 29. Bookings must be by week (7 nights from Friday to Friday) or by mini-week (4 nights from Friday to Tuesday or 3 nights from Tuesday to Friday). Holiday season is the period from July 5 to 25 and bookings must be by week from Friday to Friday. Create custom Valle Nevado ski vacations online, 24/7, using our interactive website. Simply choose your start and end dates, # of adults and children and click Create A Quote in the Trip Quote box above! Bundle and Save! 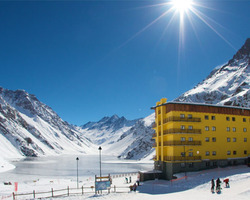 Our ski vacation packages to Valle Nevado, CL with exclusive discounts are backed by the best service in the industry. View our wide selection of lodging options, trail maps & webcams, snow reports, ski school information, dining, activities & shopping, and maps! Valle Nevado Ski Resort Packages & Deals - Save up to 50% Need Help? Call Toll-Free, 877-4-SKI-EAST, to talk to a Ski & Snowboard Vacation Specialist today!